Stash Hotel Rewards® Visa® Card: Should You Get It? A great card for anyone who doesn’t mind the limited number of places you can use Stash Points at -- just 150 hotels nationwide, as of writing this review. The Stash Hotel Rewards Visa is an excellent hotel credit card for those individuals who stay in boutique hotels, and like to avoid big chains. For those already familiar with the Stash Rewards program, this card provides a lot of great ways to earn additional reward points through everyday spending -- especially from dining and gas purchases. How Does The Stash Hotel Rewards® Visa® Card Compare? Review: Is The Stash Hotel Rewards® Visa® Card Worth It? The Stash Hotel Rewards® Visa® Card is a pretty good card that rewards people for shopping at hotels, restaurants, and gas stations. The card’s rewards program, Stash, is designed for boutique hotels -- ones that are not tied to one of the giant hotel conglomerates. Therefore, while this card offers very high rewards rates on the aforementioned categories, it should be noted that they can only be used towards stays at the 150 participating hotels across the nation. While this number is growing, it’s nowhere near as large as big chain hotels. Hilton, for example, has a portfolio of over 4,660 properties worldwide. If you don’t like the constraints this puts you in, we recommend going with a general travel credit card or a hotel credit card belonging to a bigger brand. If you don’t spend more than $10,000 per year on categories where this card earns you two points per dollar or more, we recommend going with a no annual fee card. Otherwise, the $85 per year you’ll be paying will cost you more than you'll get through rewards. For example, if you spend $8,000 in a single year, you can earn approximately $228.80 in rewards, assuming a 2.86% rewards rate. If you subtract out the $85, that comes out to a net $143.80. On the other hand, if you were to charge those same purchases to the Citi® Double Cash Card and pay your credit card bill, you could be walking away with $160. The other feature worth noting is the fact that this card has no foreign transaction fee. Most credit cards will charge you a 3% fee when used outside of the United States. If you want to use a credit card when traveling abroad, the Stash Hotel Rewards® Visa® Card is a good choice. Most of the Stash Rewards hotels, however, are located in the United States. Bottom Line: If you already like the Stash Rewards program and you're someone who spends a lot on gas and dining, the Stash Hotel Rewards Visa credit card is a very good option. However, unless you spend more than $10,000 annually on your credit card, you won’t come out ahead of the $85 fee. If that’s the case, it’s better to go with a card with that has fixed 2% cash back rewards and no annual fee. 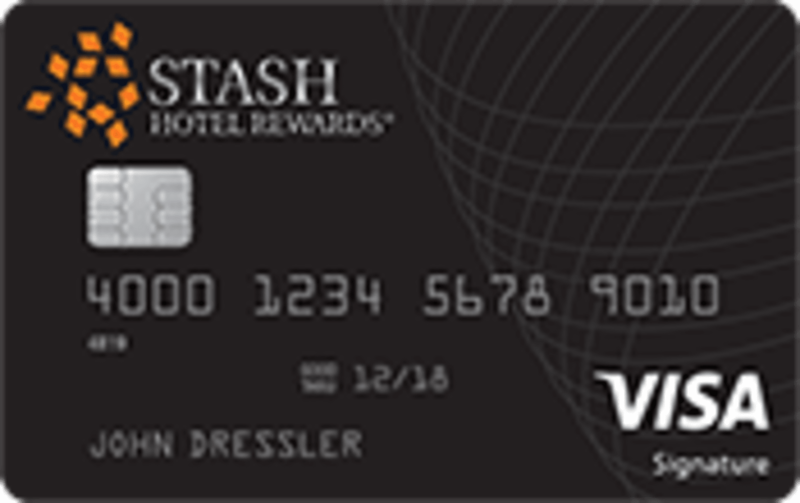 The Stash Hotel Rewards® Visa® Card is all about earning you extra reward points. You get three points per dollar whenever you use the card to book stays with Stash Hotel Reward partners. These points are earned on top of the base rewards you’d earn for staying with the hotels in the first place. You can also get two points per dollar on all other hotel, dining and gas purchases. Every other transaction that doesn’t fall under one of the aforementioned categories earns a net one point per dollar. Every time you redeem your points you will also receive a 10% points dividend. For example, if you were to redeem 20,000 points, you would get 2,000 back in your account. That works out to what we think of this as a 10% discount on the price of bookings (when using points to pay). This reward structure results in rewards rate of anywhere between 1.43% and 4.29%. If most of your spending skews towards dining, gas, and hotel stays your rewards rate is likely to be above average 2%, which is quite generous. If you can make $1,500 in purchases within the first 90 days of opening your account, you will receive an additional 10,000 bonus points. We estimate the value of this bonus to be roughly $130. This bonus is unlikely to cover the entire price of a booking, as most cost 15,000 points or more. The Stash Hotel Rewards credit card comes with an $85 annual fee that’s waived during the first year. Therefore, you will need to spend a certain amount of money and earn enough rewards to make paying this worth it. As a rule of thumb, if you spend less than $10,000 per year on gas, dining, or hotels, the Stash Hotel Rewards Visa card is probably not worth the fee. What’s The Value of Stash Rewards Points? We value each Stash Reward point at roughly $0.013. Redemptions on the program are not fixed, and therefore the value you get out of your points will vary. The only exception to this appears to be at rooms in the same hotel. For example, you will be getting the same value per point whether you book a queen or king bed at the Vintage Villas Hotel. To obtain the above average we sampled a number of itineraries, across different dates and locations throughout the United States. We took the price for each booking and divided it by its corresponding price in Stash points. The table below shows a few examples of this process. How Does The Stash Rewards Visa Credit Card Compare To Other Options? The only way to get a sense of a card’s value is by understanding how it stacks up against other available choices. We compared the Stash Hotel Rewards credit card to some other leading options, to give you a better idea where the card excels and where it flops. TheStarwood Preferred Guest® Credit Card from American Express is one of our favorite hotel and travel credit cards. Though it’s co-branded with the Starwood and Marriott hotel chains, the points you earn through this card are not tied to just free nights. You can transfer the points to over 40 airline partners. From a reward flexibility standpoint, the Starwood Preferred Guest® Credit Card from American Express wins over the Stash Hotel Rewards credit card. The Chase Sapphire Preferred® Card is one of the best credit cards available to consumers, especially those who spend heavily on dining and travel. Though it’s rewards rate isn’t as high as what you get with the Stash Rewards Hotel card, the card makes up for it through a great rewards program. The Chase Sapphire Preferred® Card is part of the Ultimate Rewards (UR) family of cards. These points can be used to book travel through the UR portal, cash back, statement credit against previous card purchases, or even transferred to a number of different airline and hotel partners. If you don’t like the idea of having your points locked up in one reward programs, you may be better off opting for a card like the Chase Sapphire Preferred® Card. The Citi® Double Cash Card is not affiliated with one particular hotel or airline. Instead, the card provides cash back rewards on all purchases. The Citi® Double Cash Card gives a fixed 1% back on everything you buy, and then another 1% when you pay charges off. Another feature worth noting is the fact this card doesn’t have any annual fee. Therefore, if you spend less than $10,000 each year, you will come out ahead by using this card, instead of the Stash Rewards Credit Card. How Does The Stash Hotel Rewards® Visa® Card Compare Based On How You Spend? When trying to figure out a card's value, it’s important to consider your spending habits. Since some cards are more rewarding, for example, on gas or grocery purchases, so it’s a good idea to optimize your selection. The tool below will help you see how the Stash Rewards Credit Card compares based on those parameters. Simply enter your estimated monthly spending by category, and our tool will give you our estimates for each card’s value.